The cocktail Skinnygirl Margarita, introduced to us by the Bravo TV reality show The Real Housewives of New York, has been turned into a bottled drink by its creator -- natural foods chef turned TV star Bethenny Frankel. 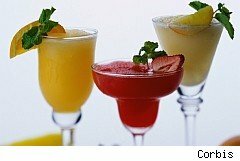 The "Real Housewives" star's concoction is now available through distributors in 22 states and can be bought online through other retailers listed on the website, skinnygirlcocktails.com. The drink got attention after the "Real Housewives" star ordered it in the show's first season and reality show fans clamored for the recipe. Frankel created the drink because traditional margaritas have more than 500 calories per 4-oz. serving, says the skinnygirlcocktails website. Frankel shares the recipe on her personal site.